The Health Department sealed a noodle factory operating in the Mohakampura area on the Batala road here today. The department also collected samples and destroyed "petha" from two "petha" manufacturing units. Mystery shrouds the death of Balwinder Singh (45), a resident of Shaheed Udham Singh Nagar, here today. A married woman was allegedly raped by two youths at Chhan Kohali village, falling under the Bhindi Saida police station, about three days ago. Ahead of the crucial Municipal Corporation (MC) House meeting tomorrow, Mayor BR Arora is facing a rough weather as his own party councillors have come out against his "dictatorial attitude". Earlier, the SAD councillors were up in arms against him and the Mayor had to call off the meeting scheduled for May 30 for this reason. Amritsar Central Jail may often be in news for wrong reasons like gang wars, narcotics and drug peddling, but it has got a positive picture to portray too. Guru Nanak Dev University Vice-Chancellor AS Brar unveiled his agenda for the university as he steps into the fifth year of his tenure as the VC. The police has booked Roshan, a rickshaw-puller, who had allegedly attacked his wife with sharp-edged weapons injuring her critically a couple of days ago. 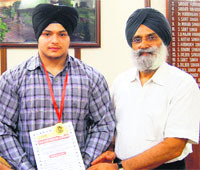 Dildeep Singh, a student of Khalsa College of Engineering and Technology (KCET), has brought laurels for the institution by winning a gold medal in the Punjab State Powerlifting Championship held at Nadala. With the launch of night patrolling by Deputy Chief Minister Sukhbir Singh Badal, the city and the Amritsar rural police have deputed over 630 policemen (450 in city and 181 in rural areas) for the job. A resident of Chak Bamu village, Tarsem Lal, was killed while his daughter Sukhwant Kaur sustained serious injuries when a speeding bus hit their motorcycle near Chaugawan village yesterday evening. The Amritsar rural police has arrested two persons for stealing power transformers installed in the villages. After making their successful entries into the silver screen, two city-based young actors, Jass Bhatia and Bhanu Mehra, are basking in the glory of being a part of respective successful films and audience appreciation. In the spotlight, we get talking to the two about the highs and highs of tasting success on screen. Dr Shiv Karan Singh Kahlon, District Health Officer, said in total 12 samples were collected from the three factories. He said the noodle factory, run by Kamal Kishore, was sealed as it was found operating in unhygienic conditions. He said dead flies were seen in the "petha" at two units. The stocks were destroyed and notices were issued to the owners, said Kahlon. The health teams found labels with "manufactured and packed in the USA and UK" from the "petha" units. "Though they are manufacturing the sweets locally, but selling in market claiming that they have been manufactured in the USA and UK," said Kahlon. Kalhon said all the three units were operating on a large scale and supplying food products to dozens of dealers in the city. He said samples were sent for testing to food testing laboratory in Chandigarh. The Health Department in its drive against substandard foods initiated earlier this year has so far sealed 10 illegal food factories in the city. This was the fifth noodle factory in the city sealed by the department. Dr Kahlon thanked the general public for cooperating in the drive against unsafe foods. He encouraged people to supply relevant information to the department so that action could be taken against food businesses selling unsafe food. After preliminary investigations, the Sultanwind police has booked mother Sumitra Devi and paternal uncle Baldev Singh of the deceased. The incident came to light when the accused called their relatives for the cremation. They, however, got suspicious after finding injuries inflicted by a sharp-edged weapon on the body of Balwinder Singh and called the police. Earlier, the mother of the deceased told the police that some unidentified persons knocked at the door last night and when Balwinder opened the gate, they slit his throat with a "datar" and fled away. Rekha, sister of the deceased, said that Balwinder had been having a dispute with his wife for the last seven years and she alleged that it was her handiwork to eliminate him. However, Sumitra’s statement could not satisfy the police party, which launched an investigation in the death of Balwinder. Further, the residents of the area knew nothing about the incident. “Initial probe found that though Balwinder was killed at about 12 in the night, but Sumitra and Baldev did not raise an alarm and called neighbours or the police. They waited till morning for informing the police. Further, the blood was also washed from the verandah raising serious questions on the statement of the deceased’s mother,” said Palwinder Singh, officiating SHO of the Sultanwind police station. The police also found the blood-stained cloths from the house. He said the "datar" used in the crime was also found from a vacant plot located opposite to their residence. Palwinder said Sumitra and Baldev Singh were arrested and a case under Sections 302, 201 and 34 of the IPC was registered against them. He said the team was also looking into the motive behind the murder. However, the victim lodged a complaint with the police only last evening. No arrest has been made so far. The victim stated to the police that she had been living with her parents following a dispute with her in-laws. She alleged that on July 11 her parents had gone to work in the fields for sowing paddy when Sabu along with his friend Bhinder, both residents of neighbouring Kotli Dasaundhi village, barged into the house and raped her. She said she narrated the instance to her family, but due to the fear of social stigma they did not file a complaint at that time. Interestingly, the prime accused Sabu runs a clinic in his village and was a frequent visitor to their house. Assistant Sub-Inspector Prabhjit Singh, who has been investigating the case, said a case under Sections 376 and 34 of the IPC was registered against Sabu and Bhinder. He said whether Sabu was a qualified doctor or a quack was yet to be ascertained. Preliminary investigations revealed that he used to run a clinic in his village. He said the accused had been absconding since the registration of the case. Even as several BJP councillors, during a meeting held yesterday at the residence of BJP district general secretary Tarun Chugh, had showed their resentment against the Mayor openly and demanded his removal from the seat, BJP leaders denied it outrightly. Naresh Sharma, BJP district president had to intervene in the matter and conducted a review meeting with the BJP councillors to know their point of view. 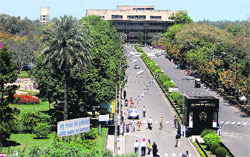 When contacted, Naresh Sharma said the bitterness among councillors was due to the development works in their wards, which remained pending, but it was not against any individual. "I, too, had learnt about the alleged resentment among our party men towards the Mayor, but nothing substantial came out of it. It is true that there were some BJP councillors who argued over the pending works in their wards, but it was a common concern as due to paucity of funds, several public-oriented development works have been suffering," he clarified. "We conducted a meeting today to know about their point of view. Believe me, there was absolutely nothing of the sort. Even the BJP councillors whose names surfaced about demanding the Mayor's removal from the seat, too negated such statements, which were just the work of some rumour mongers," he said. Nonetheless, during the meeting, the councillors raised the issue of the rigid attitude of the Mayor. The prominent issue raised during yesterday's meeting was installing and later dismantling the semi-high mast lights at Katra Ahluwalia located in the central constituency. These lights were installed with the efforts of ward councillor Jarnail Singh Dhot and were inaugurated by Chugh. The issue gained significance when Mayor, reportedly, got infuriated after finding his name missing on the inauguration board of the project. Consequently, these lights were later removed resulting in gross resentment among the residents and the councillor concerned. Even as Dhot confirmed about the controversy, but said the matter had been resolved now. “It was lack of communication which led to the controversy. After the matter came to light, the Mayor clarified his stance and we were satisified. The Commissioner has assured us to re-install the lights soon," he said. On the other hand, Mayor Bakshi Ram Arora said the issue was being blown out of proportion. "There is not an iota of disagreement over any issue among the SAD-BJP councillors. We are going to table development agenda in tomorrow's House meeting. It will also involve those pending projects which were discussed during the last meeting held in January. We will be taking Rs 100 crore from HUDCO and another Rs 50 crore from the Bank of India by mortgaging the Guru Nanak Bhawan property located near the bus stand,” he clarified. Three inmates have completed degree in MBA, six in Master's and 12 became graduates. Deputy Jail Superintendent RK Sharma said besides this, as many as 50 inmates had completed certificate course in food and nutrition and an equal number of inmates had successfully done a certificate course in human rights. With a view to reform the inmates, Amritsar Central Jail had established an education centre with the help of Guru Nanak Dev University (GNDU), Indira Gandhi National Open University (IGNOU), New Delhi, and Government Polytechnic, Amritsar. The GNDU also supported this project by providing infrastructure and by appointing special faculty for imparting specially designed vocational courses to prisoners. This reform was not an easy journey. Courtesy goes to then DIG (Jail) Kunwar Vijay Partap Singh, who under the guidance of first woman IPS officer Kiran Bedi, took the initiative to start a self-sufficient "Total Literacy Campaign" in 2006 to impart basic education to illiterate prisoners with the help of educated prisoners and supported by the community for bringing change to the mindset and fate of the jail inmates. A portion of the jail was renovated and converted into a school block. A technical training workshop, too, has been established here in collaboration with Government Polytechnic, where inmates are given training in electrical and carpentry courses. Today, this block houses six classrooms, library, computer lab, examination centre, teachers' rooms and an office. At present the jail, in collaboration with GNDU, runs programmes in skilled works for women inmates, which include tailoring and dress designing. The university confers upon them certificates after they successfully complete their course. An inmate, who recently achieved MBA degree through IGNOU, said it was through this literacy programme that he could be able to improvehis academic qualification. Adequate arrangements had been made in the jail for those inmates who seriously wanted to improve their academic qualification. A special cell has been kept reserved inside the jail to help them concentrate on studies. According to officials, the Centre of Excellence in Computers, established with the help of prisoners and supported by the university, has produced over 250 computer literates in the prison so far. Meanwhile, the Legal Aid Cell, established with the help of prisoners having legal background in collaboration with District legal Services Authority, contributed in releasing more than 600 poor prisoners. Sharma said the women inmates, too, have been made self-reliant, so that when they should be able to be a part of the mainstream after their sentence and earn their livelihood through skilled jobs. Showing his gratitude towards teachers, officers, employees and students of the university, Prof Brar said quality education, research and transparent administration were his prime priorities. He said the impetus to research in material sciences, various areas of life sciences, language and literature, and social sciences would be provided so as to get new leads into these areas which would help the whole humanity. “In the coming five years, the university envisages solving the problems faced by the state due to pollution, agro waste, solid waste etc. by using fermentation technology and lignin biomass conversion methods,” he said. The university has been awarded with the status of 'University with Potential for Excellence (UPE)' by the University Grants Commission (UGC) in 2012 and got a grant of Rs 50 crore. “By achieving this, the university has been catapulted to 10 best universities of the country. Further because of the UPE status, it is the only university in Punjab where every M Phil student gets Rs 5,000 per month and non-NET qualified every Ph D student gets Rs 8,000 per month as the fellowship,” he said. Catering around 20,000 students, the university has state-of-art infrastructure in academics, culture and sports to meet the international standard. The hockey stadium was revamped and a velodrome and shooting range of international standards has been constructed. Similarly, in the field of cultural activities, the university won the North Zone Inter-University Youth Festival Overall Championship in addition to fine arts, literary and theatre trophies in 2011-12 and also won overall championship in 2012-13. This year all five item-wise trophies in music, theatre, literary, fine arts and dance were won by the university. The university is the first institution in the region to introduce an online admission process for its courses, online counselling for state-level admissions and credit-based evaluation system. Keeping in view the increased number of girl students seeking admission in various courses, a six-storey hostel is being constructed on the campus at a cost of Rs 14 crore. The fully-equipped hostel, including wi-fi connectivity, will be able to house around 750 girl students. The university has formed the Progressive Education Society to help and train children from poor families of rural Punjab and to equip them to crack IIT-JEE. To empower the rural students, the university has started of rural colleges in Verka, Kapurthala, Gurdaspur, Narot Jaimal Singh, Chung and Tarn Taran under the Punjab Governmentt and UGC schemes at a cost of Rs 15 crore for each college; and two regional campuses - one at Sathiala (at a cost of Rs 9 crore for centre and Rs 5 Crore for hostel) and Fattu Dhinga (Sultanpur Lodhi, Rs 10 crore), Kapurthala. The victim was rushed to the Guru Nanak Dev Hospital. The victim, identified as Dimple, sustained injuries on her face, waist and hands. The police today registered her statement. A case has been registered in this regard, but till now no arrest has been made in this regard. It may be recalled that Dimple has reportedly been living separately from her husband Roshan for the past few months. The couple has two daughters from the marriage. The victim’s mother Rani, a resident of Haripura, said her daughter was married to the Roshan about six years ago. The two had an affair before marriage, she added. After a few months of marriage, quarrels between the couple became a routine affair as Roshan used to beat her under the influence of liquor, she claimed. The victim’s mother said Roshan was an acute drug addict. Perturbed over this, Dimple had been living with her parents for the past four months. on Saturday when she was returning from work, the accused stopped her and entered in an altercation. Soon after he took out a sword and attacked her and inflicted serious injuries, she claimed. Dildeep was honoured by Khalsa College Governing Council (KCGC) honorary secretary Rajinder Mohan Singh Chhina in his office. Chhina promised him all help for his future pursuits. Dildeep said he would like to participate in inter-college, inter-university, state-level and national events. KCET principal Amarpal Singh said Dildeep was one of the promising sportpersons and he would be duly awarded for his achievement in the coming days. The aim of launching the patrolling was to enhance security in the view of the rise in crime incidents during night. It has been found that tourists in the city become a target of unscrupulous elements many times when they are going to the Golden Temple or returning to their hotels late in the evening. Deputy Commissioner of Police (DCP) Kaustubh Sharma said 170 police parties, including 60 static parties, comprising 450 policemen had been formed to keep a close watch on criminal activities in the city. “As many as 18 PCR motorcycles and 14 SUVs would be put at the disposal of these policemen who would patrol vulnerable areas, especially around the Golden Temple, railway station and bus stand during the night,” said the DCP. The ADCP and ACP rank officials have also been deputed to keep a check on them, he said. Meanwhile, the Amritsar rural police has identified 17 police nakas and constituted 18 police parties for the night patrolling. Amritsar rural police SSP Manmohan Singh said the naka police party would conduct checking at five different places falling under the police station concerned. The team would be headed by an ASI and three constables. He said the patrolling parties would have been provided with three halt points in the areas falling under the respective police stations. He further said three highway patrolling vehicles and an ambulance would be deputed 24X7 and the teams had been equipped with communication systems. A DSP and an inspector rank official would check the proper functioning of the police teams. Hopefully, he opined, the enhanced police surveillance during night would deter the criminals from carrying out their nefarious activities. The first of its kind initiative would help in curbing the crime especially on national highways, state highways and link roads, the officials pointed out. The first of its kind initiative would help in curbing the crime, especially on national highways, state highways and link roads. The aim of launching the patrolling was to enhance security in view of the rise in crime incidents during night. The city and the Amritsar rural police have deputed 630 policemen (450 in city and 181 in rural areas) for the job. The naka police party would conduct checking at five different places falling under the police station concerned. The team would be headed by an ASI and three constables. The police has booked the driver of the bus, but no arrest has been made till now. Amarjit Singh, son of the deceased, said they were returning home after attending the bhog ceremony of his grandmother when the mishap happened. He said his father and sister sustained injuries and were rushed to Guru Ram Dass Hospital at Vallah where he breathed his last. The driver of the bus fled the scene leaving the bus abandoned. The police has recovered 5 kg of copper wires of transformers, iron cutters and various equipment from their possession. The Mehta police has registered a case against Satpal Singh of Ram Diwali Musalmana, Bikramjit Singh and Bachitar Singh of Dawod village. According to police authorities, Satpal Singh and Bikramjit Singh were arrested by the police while Bachitar Singh was still at large. ASI Rajinder Pal Singh said following a tip off, the police intercepted Tata Safari vehicle (BL-8C-J-3886) of the accused, who were involved in stealing transformers and its equipment and arrested them. It was Pankaj Kapur’s ‘Mausam’, which introduced Jass Bhatia to Bollywood. And once you make a big debut, it makes you hungry for more. So, Jass too had his eyes set on bigger things and ‘Bhaag Milkha Bhaag’ happened. The young actor plays one of the supporting character roles in the film, adding humour to the serious biopic. “It has been great post the release of the movie. Since my role is short, I had some apprehensions about getting noticed, but the appreciation I have received makes it very special,” he shares. His short, but impressive cameo in the film got him a fan too. “Prasson Joshi, scriptwriter of the film, complimented me on my comic timing and dialogues at the film’s premiere in Mumbai. Pavan Malhotra who is a part of the film, also appreciated my work,” says the excited actor. For someone who was working on his first big banner in one of the most anticipated films of the year, sharing screen space with Farhan Akhtar wasn’t all scary. “I was nervous, but then Farhan made me relax after the first shot. He is a humble guy who respects an artist and actually helped me get the act right. After the shoot, we used to hang out, talk about his passion for films, singing and it was just like talking to a friend,” says Jass. She got noticed after her big break with a Telegu film, Varudu opposite Allu Arjun. But the true blue Punjabi girl Bhanu Mehra has finally made it back home as well. Making her debut in ‘Fer Mamla Gadbad Gadbad’ opposite Roshan Prince, the success of the movies came as a welcome surprise for her. Bhanu, who took the road down South to enter Bollywood, feels Punjabi cinema is like “home”. “It is a different experience, where language is not an issue and I am already in a comfort zone being a Punjabi. Also, home is much closer.” She also talks about raising expectations with a hit.